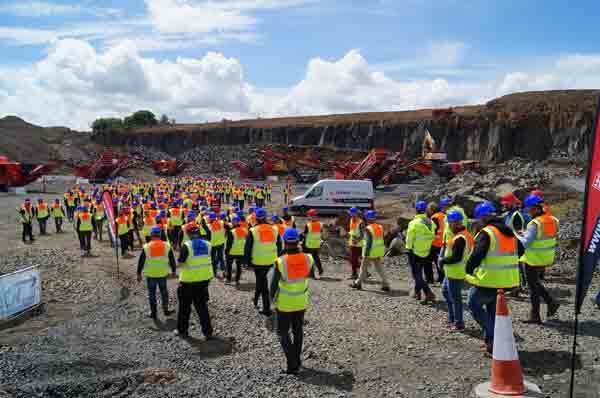 Terex|Finlay, hosted an international open day in Edinburgh, Scotland, on Thursday 15th and Friday 16th June, 2017. The event had a very international feel with dealers and end-user customers in attendance from North and South America, Europe, Russia, Japan and South Africa. In total over 350 dealers and customers visited the site over the two days. 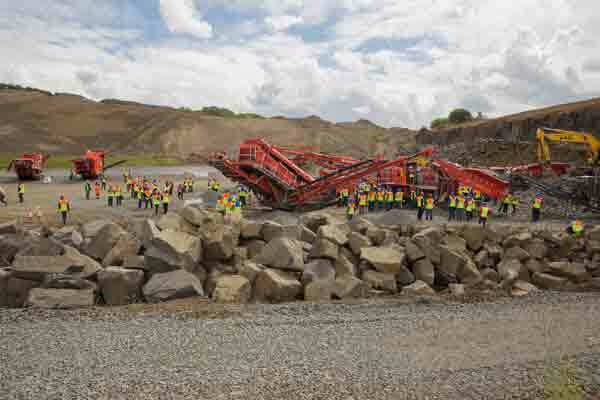 The event and product demonstration were hosted by Alex Brewster & Sons, Craigpark Quarry, Edinburgh. At the event Terex|Finlay unveiled 3 brand new models; J-1160 & J-1170 (direct drive) jaw crushers and I-120RS impact crusher. In addition of the prototype model 684 3-deck inclined screener that will be launched in Q4, 2017, was also showcased. The headline act featured the NEW J-1160 jaw crusher, C-1540 cone crusher and NEW 684 3-deck prototype working in a train. Featured the NEW J-1170 (direct drive) jaw crusher working alongside our recently launched TC-80 tracked conveyor. Featured the Terex|Finlay 883+ Spaleck recycling screen working in a contaminated and sticky soil application. Featured the recently launched Terex|Finlay I-140 impact crusher working in a C&D recycling application. Featured the NEW I-120RS impact crusher with recently launched 674 inclined screen working in a C&D recycling application. In addition to the working machine displays the following machines were also on static display: 863 & 883+ heavy duty scalpers, 595 heavy duty grid, 693+ inclined screen, J-960 Jaw Crusher, J-1170 Jaw Crusher and C-1545 Cone Crusher. “It was a huge pleasure to welcome so many international dealers and end-user customers to yet another successful Terex|Finlay open day. Innovation is at the heart of Terex|Finlay mission and vision. We’ve had yet another busy year of new product developments and it’s gratifying to receive such positive feedback on our efforts. We place a lot of emphasis on listening to what our customers’ tell us they want and need from their equipment day in day out and judging by the feedback that we have received on the new product launches we are definitely on the right track with our new product development initiatives. To our hosts, Alex and Scott Brewster, “We owe you a huge debt of gratitude! Working with you was a pleasure from start to finish, and we feel so honored to have had access to such a great site. Thank you for making our open days, the success of the event was in large part due to you guys and your committed colleagues! Additional details about each of the NEW machines launched or previewed at the Open Day. The new Terex Finlay J-1170DD builds on the legacy created by the original J-1170 Jaw Crusher. We have taken all the great features from the original machine and added additional features. The direct drive arrangement between the powerunit and chamber enables operators to maximize fuel economy. On site comparisons have been completed with excellent results achieved so far. To further reduce fuel consumption we have installed an efficient load sensing Danfoss PVG hydraulic system. This ensures only the oil that is required is utilized. Robust proven Terex 1100mm x 700mm jaw crusher for high capacity and large reduction ratios in quarrying, mining, demolition and recycling applications. Optional hydraulic release for demolition and recycling applications. •	Compact dimensions and quick set-up make the J-1170 the optimal solution for contract crushing as well as demanding in-pit applications. •	Direct drive jaw chamber fitted with an unblock feature that maximizes uptime. •	Hydraulically assisted closed side setting adjustment minimizes downtime and offers quick adjustment. •	New model is more recycle application friendly with increasing clearances under the crusher and improved main conveyor design to reduce snagging of rebar. •	Machine transport is improved upon. The machine weight is sub 36,000kgs (80,000lbs) which requires either no or a lower class of permit in certain countries. •	High powered hydrostatic drive ensures precise chamber controls and reverse functionality for clearing blockages and assisting in demolition and recycling applications. •	Fully hydraulic adjustable closed side setting minimizes downtime and offers quick adjustment. The NEW Terex|Finlay I-120RS impact crusher has been developed to replace our current I-110RS model. As a response to market led feedback we have integrated the enhanced material flow process through the plant that was initially proven in our recently introduced I-140 and I-140RS models. We have proven increased productivity from the plant through extensive field testing in a range of recycling and mineral processing applications. •	Quick on-board detachable recirculating system including large 3.66m x 1.53m (12’ x 5’) two deck screen. •	Recirculating conveyor can be rotated from closed loop configuration or utilized for stockpiling making an additional oversized product. The second generation new Terex Finlay 684 screener has been designed with the customer and operator in mind, there are a number of important design updates that set this machine apart from its predecessor. For ease of onsite movement and rapid setup and tear down times the overall machine and conveyor folding design has been simplified and reconfigured to give rapid on site deployment. We have retained the original screenbox that features three large 4.3 x 1.7m (14’ x 5’ 7”) inclined screens giving a large screening area of 236 square ft to provide efficient screening and high capacity. •	Triple deck 4.3m x 1.7m (14’ x 5’ 7”) screen with full catwalk access. •	The fourth (oversize plus) conveyor provides variable tilt and slide slew capability to accurately discharge materials for recirculation to crushers or for stockpiling. •	Maximum utilization of three 4.3m x 1.7m (14’ x 5’ 7”) decks provides ultra-efficient screening capabilities even at small aggregate sizes. •	A combination of quick wedge tensioning, convenient access holes and hydraulic tensioning on the bottom deck ensure mesh set up and change out times are kept to an absolute minimum.